Lot size: is 25 x 115 Feet – attach survey to all offers. Parking: Detached 1 car garage and private drive parking for 2 cars. Right of way walk way to north of property. 4+ bedrooms & 3 full baths plus finished lower level - ideal in-law/nanny suite with separate side entrance. A rare bonus of a solid detached 1 car garage with private drive parking for 2 cars! Serene outdoor space. Walk-out from the family room to lush back garden, towering trees, flagstone patio and deck! Private gate into Kew Gardens. Highly sought after school district attracts many to this family friendly pocket including Kew Beach Jr PS, Glen Ames Sr PS and Malvern Collegiate. Just a short stroll to all the fabulous shops & restaurants on Queen Street East, or down to the Lake! The Beach is nature’s wonderland of Lake Ontario, Martin Goodman Trail, mature trees and the marvellous Boardwalk and is one of Toronto’s most popular tight-knit neighbourhoods! Kew Gardens & Tennis Club stretches from Queen Street East down to the Boardwalk and is the neighbourhood social centre hosting many annual events including the Beaches International Jazz Festival each summer and a Christmas Tree and Menorah lighting. The park includes tennis courts, a baseball diamond, a wading pool, and you can even join in a game of shinny on the skating rink in the winter! In the northeast corner of the park is the historic Beaches branch of the Toronto Public Library. Kids play! Dogs play! The best part is that other than about 60 days a year when tourists come, it is really “your own”. Queen Street E. offers a diverse mix of casual restaurants, boutiques & eclectic shops. Find big box stores, a major Loblaws store and the Beach Cinema east of Woodbine. Uber trendy Leslieville shops and restaurants are directly east on Queen. Enjoy the amazing natural attractions including the Boardwalk along Lake Ontario, Ashbridges Bay, and the Beaches waterfront parks connecting to the city wide waterfront Martin Goodman Trail. Walk the dog in the off leash dog park at bottom of nearby Lee Avenue. Keep fit all year round. Many families are zeroed in on this school cachment and neigbourhood to attend Kew Beach Jr PS, Glen Ames Sr PS and Malvern Collegiate. Walk to private, French Immersion & Catholic schools & local community centre. Plenty of public transit via the Queen Street streetcar that runs through Toronto's Financial District. Connect to Bloor-Danforth subway via Woodbine Avenue. Go Green by bike to subway or around the neighbourhood. Driving in and out of town is easy with proximity to Lakeshore Blvd. E, Gardiner and DVP. Kingston Road also leads directly to Highway 401 East. Welcome to 93 Waverley Avenue! 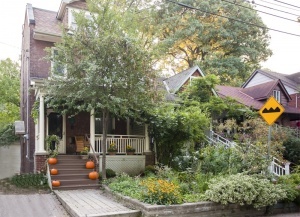 A rare find in one of Toronto’s most preferred neighbourhoods. Prepare for the whole family to fall in love! Enter via large covered front porch perfect for people watching while you have your morning cup of coffee! Greet guests in the foyer with double French doors, slate floors and convenient double coat closet. Gracious open concept large living and dining room is flooded with natural light featuring high ceilings, hardwood floors, enchanting wood-burning fireplace & mantle and halogen pot lighting. Enjoy large family dinners & entertaining. Renovated gourmet kitchen (2008) will entice the chef at home! Everyone gathers around the centre island with marble countertops, custom cabinets, granite counters, quality stainless steel appliances & gas stove, large bay window with matching marble, pot lighting, hardwood floors, pantry and plenty of cupboard and counter prep space. Sunlit family room has a double closet for coats & boots when entering from yard or garage, halogen pot lighting and a walk-out to the back deck and garden. Ideal space for kids! Popular multipurpose room for homework, arts & crafts or main floor home office! Upstairs the intimate and separate master bedroom suite is a dream! King sized and sun-filled with 2 large bay windows overlooking the gardens! Oversized walk-in closet includes hidden sliding doors and built-in shelving. 4 piece ensuite has a deep soaker tub and pretty stained glass window. HUGE 2nd bedroom was originally 2 bedrooms, combines great space to create a full bedroom plus sitting area – great for kids to share a room. Hardwood floors & bay windows face the front garden! 3 piece spa-like bath completely gutted & renovated! Limestone floor/walls, pedestal sink and glass enclosed shower. Separate linen closet completes the second level. Delightful third floor skylight streams natural light down to 2nd floor! 3rd bedroom faces the front garden with pretty picture window and deep closet will accommodate a queen bed. Generous 4th bedroom! Hardwood floors, skylight, closet, large bay window with built-in banquette and a walk-out to the most unbelievable wrap around deck! Enjoy watching fireworks in the privacy of your own home with room for large patio furniture. Spectacular fully finished lower level! Separate side door entrance, open layout and extra high ceilings throughout. Lots of natural light. Meticulous work has gone into making the basement an ideal space for a live-in nanny suite or a family hangout. Potential rental/in-law suite. Large recreation/media room to cozy up and enjoy a movie. Gas fireplace with built-in shelving and slate surround, hardwood floors, halogen lighting and double under-stair storage! Designer 3 piece bath with slate floors and custom vanity renovated in 2012. Step-up to the kitchenette with additional storage/utility room for all your extra “stuff”! Great “work/tool room” or potting shed. Rear bedroom/office has a double closet, window and halogen lighting. The current owners have used the lower level space for their live in nanny for the past 9 years and she has loved it. Laundry room nicely tucked away behind closed closet doors next to the bathroom. Outdoors you'll appreciate the private/shaded professionally landscaped low maintenance garden. Large party deck works well for hosting parties, pergola, useful storage shed area for all your gardening tools/supplies, quaint flagstone walkway. Lots of shade from neighbours towering trees! Garage was rebuilt and is in great condition with skylight! Fits car and bikes & outdoor furnishings.